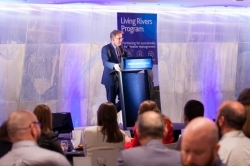 Living Rivers recently celebrated their ten year anniversary with a lively dinner attended by a range of partners, state and local government. This milestone marked ten years of projects that have worked to improve the health of waterways and the bays, support the ongoing liveability of local places and enable thriving landscapes through stormwater management. At this event, Gheran Steel from the Boon Wurrung Foundation gave a Welcome to Country which reflected on the importance of waterways and the bays for the indigenous inhabitants of the Melbourne region. John Thwaites (Chair of the Melbourne Water Board) then presented on how the water industry has evolved towards more sustainable stormwater management in response to pressures such as the Millennium Drought and how an Integrated Water Management approach can help address some of the future challenges in a growing city. Finally, attendees heard from Vaughn Grey (Moreland City Council) and Caroline Carvalho (Knox City Council) who provided a local government perspective on the structural and strategic transformations the Living Rivers program has helped support over the last decade. The Livers Rivers team would like to thank all of its partners and those at Melbourne Water who have worked with the program over this time.